OFF-SEASON: D. L. Bliss State Park closes to vehicle traffic October 15th 2018. D.L. Bliss State Park is CLOSED to vehicular traffic for the winter (approximately mid-October). When the park gate is closed, pedestrians may park at the Visitor's Center near highway 89 and access the park from sunrise-sunset. 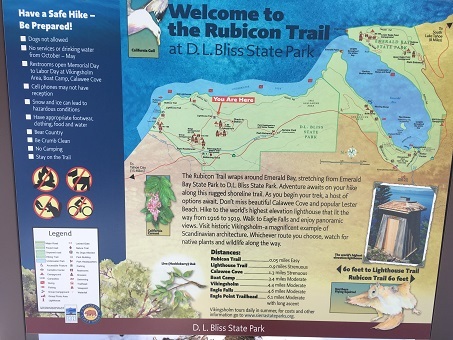 It is an approximately 1 mile hike from the Vistor's Center to the closest Rubicon Trailhead, and a steep 2 mile hike to the beaches. All park regulations apply during the off-season. No restrooms or water available. Chains and/ or 4 wheel drive are frequently required during the winter season. Please check for weather updates and road conditions. Highway 89 to Emerald Bay can be closed due to snow and avalanche conditions. If venturing into the backcountry please check for avalanche conditions. The district office number is available M-F 9-4:30pm - 530-525-7232. As of April 10th 2019, trails and roads are mostly to completely covered in snow - snowshoes recommended or groomed areas of Sugar Pine Point which is 7 miles north. The day use parking areas at the beaches and at the Rubicon trailhead are extremely popular during the summer months and are often FULL by mid morning. We recommend arriving early in the morning or late in the afternoon for best chances of finding a parking space. When the parking lots are full, day use vehicles will not be allowed into the park - No drop-offs/pick-ups, though pedestrians may walk the two mountainous miles to the beach. Day use hours are sunrise to sunset. Dogs are not allowed on the beach or trails. Amplified music is only allowed with a permit. Thank you for your understanding. Dogs are NOT allowed on the beaches, trails, or off-trail (including the bouldering areas). Dogs on a 6' leash are allowed in the campgound and picnic areas, as well as on paved roads. Dogs may not be left unattended. Dog regulations are strictly enforced YEAR-ROUND. Please do not leave your dog in a vehicle and plan accordingly. Here are some boarding options if you are away from home. D. L. Bliss Campground has closed for the 2018 season. The campsite fee ($45 for Beach Camp and $35 for all others) includes one vehicle. Additional vehicles are $10 per night. The max trailer length is 15'. The max motorhome length is 18'. This is a historic campground with small roads, small campsites and small parking pads. Some campsites only allow for one vehicle and extra vehicles will need to be placed in the balancing rock overflow parking area. This campground does not have hook-ups, however, there are showers available for registered campers. In the summer, D.L. Bliss campground offers 150 family campsites and 1 group campsite. The group site is $165 a night and available only for tent camping. For information on 2019 summer reservations, click on the "Reservations" link above, or go to reservecalifornia.com or call 800-444-PARK - Reservations may be made 6 months in advance of your arrival date. All food, beverages, and toiletries are required by law to be stored in provided food lockers except when food is being prepared or eaten. Black bears are currently very active at D.L. Bliss! 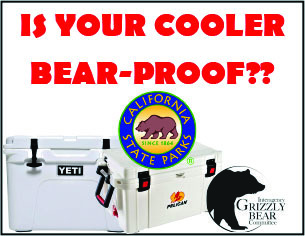 Metal bear-resistant food lockers are provided in each campsite. Ice chests may NOT be stored in vehicles and shall be stored in food storage lockers. The inside dimensions of the food lockers 36" deep, 43" wide, and 22" high. Violations will be cited. Food, beverages, ice chests, and trash must be stored in food lockers during NIGHT and DAY hours. D.L Bliss SP is located 17 miles south of Tahoe City on Highway 89, and approximately 2 miles north of the Vikingsholm Parking Lot at Emerald Bay. Summer temperatures range from about 75-80 degrees F during the day to the low 40s at night, and winter temperatures average from a high of 40 to lows in the teens and 20s; Winter temperatures may dip below 0 degrees F.
High Sierra weather is varied and can change abruptly. It is recommended to bring layered clothing and check weather updates. Weather forecast is available at NOAA. D.L. Bliss State Park is located off of Highway 89. The Rubicon Trail wraps around Emerald Bay, stretching from Emerald Bay State Park to D. L. Bliss State Park. The 7.4 miles of trail ranges from moderate to strenuous hiking offering beautiful views of Emerald Bay and Lake Tahoe. Emerald Bay and the Rubicon Trail are highly impacted in the summer. Restrooms and water are available Memorial Day - Labor Day at Calawee Cove, Vikingsholm Area, and Boat Camp. 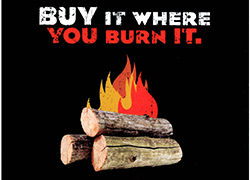 No Dogs, No Fires, No Bicycles, No Camping - The parks are open from sunrise to sunset. Cell Phones may not have reception - bring appropriate layered clothing, footwear and food and water. High Sierra weather varies and can change abrubptly. Check weather updates. As of April 10th - trails are mostly to completely covered in snow - snowshoes recommended. Campers and day use visitors enjoy swimming or scuba diving in the crystal clear water of Lake Tahoe, picnicking, relaxing on the warm sand of Lester Beach or Calawee Cove, and hiking the Rubicon Trail, Lighthouse Trail, and Balancing Rock Trail. Lester Beach is a popular location to launch your kayak, paddleboard, or canoe, but keep in mind that trailers are not allowed in the day use parking lots. Please check weather and wind conditions before venturing out on the lake.